Hailing from Germany since 2005, THYRGRIM has been expressing raw emotions in their music; giving what they believe is the suitable face of black metal. Free of cryptic symbolism, it is said “They don’t hide behind symbols, Satanism, blood or overloaded images, they create a realm of coldness and hate without using subtle means.” From this unusual introduction, I was intrigued to have a listen of their new release - “VERMÄCHTNIS”. The first track “Die Heilung dieser Welt” shifts us into the vortex with a fast and heavier performance, with bomb blasts and repetitive riffs. “Die ewige Suche” is an edgy doom sounding track, guitars hover like the wings of insects and double bass can be heard against patches of sustained guitars. “Das Dunkel meiner Seele” is slow and lowly sorrowful track, almost reminding me of depressive black metal styles. Blast beats are used infrequently, though make a heavy impact when they come in. The guitars seem to whine with their high tremolo melody. A melancholic tune echoes out among the instruments to the end of the track, which I feel adds to the emotional heaviness. I found “Pfade der Vergänglichkeit” to be slowly rhythmic, and more simplistic but also effective in conveying a hopelessly grim atmosphere. This is also the case with Gefangen im Wandel” which is beautifully sad in mood. Dark guitar tones flood all around in “Das Ende einer Reise” hosted with a short clean guitar riff repeating up and down. After almost two minutes and a half, powerful yet relaxed harsh vocals make a soul wrenching outcry in slow gasps. The energy picks up in “Offenbarung” which begins with choppy instruments and shouts, leading into grim blasts. As the last track of the album, this relatively short song ceases the album with momentum. 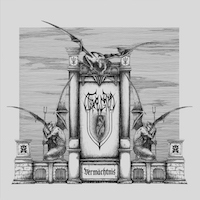 In “VERMÄCHTNIS” we have a dark and soul-grabbing performance of black metal from THYRGRIM. I personally like how this band seems to stay true to something raw - in using their German language, and expressing their emotions without an overdose of symbolism. I would personally like to hear more bass in the sound but perhaps this would retract from the atmosphere.